Exploiting an SQL injection has become relatively easy thanks to some magnificent automated tools such as SQLNinja and SQLMap, the latter being my personal favorite. Many of these automated tools are highly configurable and often allow you to circumvent blacklists/filters or even provide you with an OS shell if you’re lucky, amongst many other features. SQLMap contains an impressive collection of payloads to detect and exploit SQL vulnerabilities – their templates can be found in the payloads.xml file. SQLMap currently contains specific payloads for six injection techniques: boolean-based blind, time-based blind, error-based, UNION query, stacked queries and out-of-band. The SQL injection vulnerabilities that are not exploitable after some tweaking with SQLMap or one of its competitors are very, very rare. However, before you can exploit an SQL injection vulnerability in an automated fashion, you must detect it first. Detecting new injection vulnerabilities with aforementioned automated tools is not the best option, because of a couple of reasons. Usually these tools take a lot of time, simply because of the fact they will enumerate a significant number of payloads by default. Currently, SQLMap gives you some options to limit the number of selected payloads: –level, –risk, –dbms and –technique (to my knowledge), but even if you fully understand and utilize all these options, you still have no complete fine-grained control over the payloads that are sent as well as their respective detection method implementations. Additionally, these tools are not always fool-proof. For example, I found SQLMap’s blind time-based detection method in combination with multiple threads and some background (browsing) traffic to produce a significant number of false positives sometimes, which is quite unpleasant. Finally, when you have a web application which utilizes something out of the ordinary such as a custom CSRF mitigation implementation or an exotic authentication method, these tools usually will not be able to reach all potential injection points. What I (and undoubtly many others) usually do is select the values that may be used to fetch data from a backend manually, and then use a web application fuzzer to replace them with specific payloads to detect SQL injection vulnerabilities. Once detected, I revert to SQLMap or another automated exploitation tool. I am used to Burp Intruder for these kind of fuzzing attacks, but I’ve also occasionally used the Zed Attack Proxy Fuzzer for this task. The advantage of using an intercepting web proxy as fuzzer instead of an automated tool such as SQLMap, is that you have full control over the payloads sent and the detection method used. Also, they are used to dealing with exotic HTTP attacks such as circumventing CSRF protection, second-order fuzzing, amongst many others – as it is their ‘core business’. To my knowledge, an intercepting web proxy allows to automate detection of SQL injections via three general methods, which I compare below. If you immediately want to try out the described techniques, I recommend SQLFiddle. It supports various up-to-date versions of MSSQL, SQLite, PostgreSQL, MySQL and Oracle. 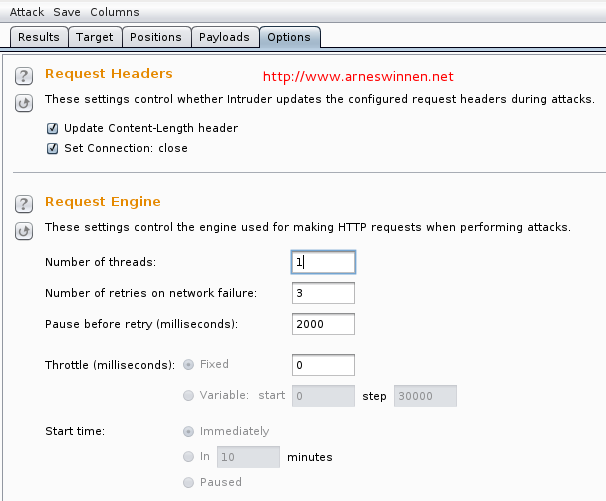 This method is based on injecting payloads that break out of the original query and generate an SQL error on the server-side which can be detected in the content of pages returned by the web application. Verbose SQL error messages must be turned on. The SQL error must be echoed into the response. Characters or words that break SQL syntax. Usually a single or double quote will do the trick, as this is part of the SQL syntax of all popular database flavors. Grep output of pages for error messages. Burp Intruder contains a list by default. Kaotic also made one and describes the whole technique. The very limited number of payloads to cover all database flavors is a big advantage, but the prerequisite of verbose error messages is often not met in current web server infrastructures and in that case, renders this technique useless. This method is based on injecting payloads that alter the outcome of the original query which results in different returned page content. The vulnerable parameter must have influence on the content of the page and therefore be used in a boolean expression, which usually limits the scope of this approach to parameters used in the WHERE clause of queries. Two adjacent OR clauses must be used because AND has a higher binding precedence than OR. This SQLFiddle should explain it all. One can clearly see that our first payload request yielded a response much bigger than the invalid base request, and all other payload requests yielded a very small response. In the bottom of the attack results window, we can see that only the HTTP headers are returned for these requests, which may indicate a failure on the server-side whose errors are suppressed – no verbose error messages here. When analyzing the payloads that caused a small response more closely, we see that they all contain characters that may break an SQL query: quotes and brackets. We can guess that this is what happened, resulting in an empty response. Integer: replace a valid parameter’s integer value with a mathematic equation that results in the same value and verify whether the two responses are the same, which would imply that the parameter’s value is directly interpreted by an SQL backend and SQL injection is very likely..
Strings: split a valid parameter’s string value in two parts, and add an SQL string concat directive in between. An identical response for both requests would again give you reason to believe you have just hit an SQL injection. Pentestmonkey’s SQL Cheat Sheets are great to quickly lookup the string concat syntax for various popular database flavors, amongst other useful queries. Alternatively, Roberto Salgado’s SQL Injection Knowledge Base is also a very good resource for MySQL, MSSQL and Oracle. This is usually the moment that I revert to SQLMap. The limited number of necessary payloads to cover all database flavors is again a big advantage. The main downside of this method is that it may still miss some injection points, which are located in different fields than the WHERE clause or do not influence the response of a web page. However, when you see a that parameter obviously influences the response of a request, this one is definitely worth trying out – e.g., a search form with many fields. 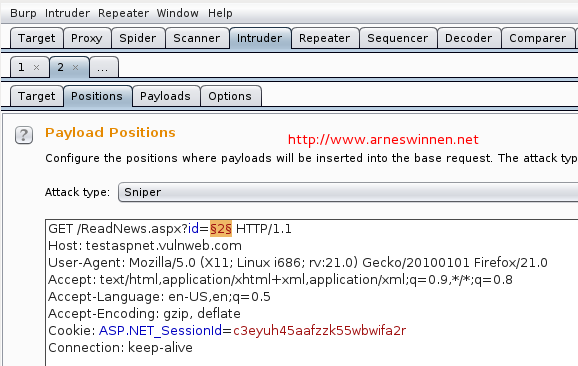 I often just enter some invalid value for each field, send the request to intruder and launch these payloads against them (spider mode). It must be noted that this method may still result in false positives – manual verification needs to be done afterwards in order to fully confirm the vulnerability. This method is based on injecting payloads that trigger a delay time for the SQL Server while processing our query, which in turn slows down the response time of our request. The parameters under assessment must not have strong length limits nor filtering, as the payloads are rather long. Almost all payloads also induce a temporary heavy load on the SQL backend, so if you’re testing on a critical production environment, consider using one of the previous, less performance-hogging detection techniques. Note that the last six payloads all use the same approach: induce a time delay by a heavy join operation on tables that are present and readable by default. They only differ in the naming of the default tables, because each database flavor uses another naming convention. The last payload covers all databases that are compliant with the SQL-92 standard, since this standard demands the presence of the INFORMATION_SCHEMA database schema. Note however that, if injected successfully, we can significantly change the result of the original query. Therefore, I modified the payloads one last time to return a very unlikely value as a result, so in case of injecting in a DELETE statement, we will not accidentally hit one or multiple records which are then deleted. You can see them live at work against INSERT, UPDATE, DELETE and SELECT here (unquote the injected queries you want to test). You can download all final payloads quartets for all aforementioned database flavors at the bottom of this post. Note that the case of MySQL is a bit different than the others, because MySQL doesn’t have a native string concat operator. In order to still detect field string injection vulnerabilities, I replaced the string concatenator operator with a simple ‘and’: SQLFiddle. When adding the ‘response completed’ column to the results view and sorting on this tab, we see that five requests took significantly longer than the other 36. 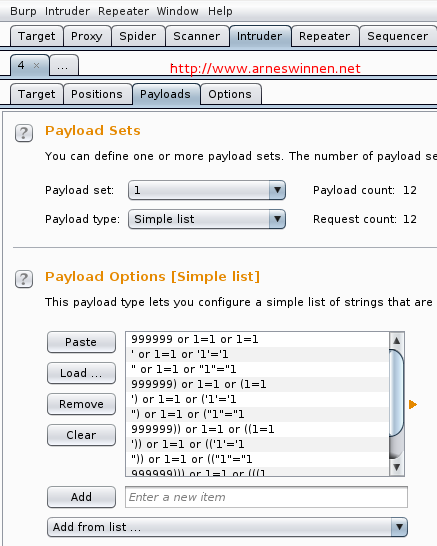 However, one of these payloads is for integer injection, one for double-quoted string injection, and three for single-quoted string injection – that doesn’t make much sense. Why would one parameter be vulnerable to all these attacks? We have now officially identified an integer injection flaw in a MSSQL backend database, which we exploited to execute a query that took more than 20 seconds to complete. I usually revert to SQLMap now for the exploitation phase. The main advantages of the time-based method in combination with the new payloads, is that they will reliably detect all present injection vulnerabilities – it’s just a matter of launching them against any field you think might be involved in a database action. Do not only test GET and POST parameters with them; HTTP headers such as User-Agent and Referer are more and more logged to a database these days. If you know the database flavor beforehand, only four payloads are necessary – otherwise you’ll have to use the collection of payloads for all database flavors, currently 41 in total, or a subset of it if you can exclude any. However, they also have some drawbacks. 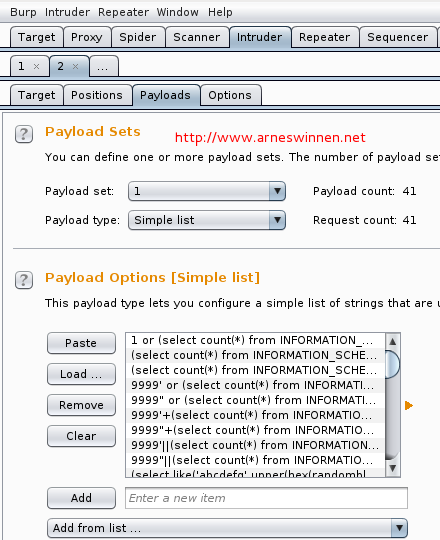 The payloads themselves are quite big, which makes them more susceptible to length and content filtering. They also induce a real performance hog on the server-side, which may be undesirable in some occasions. Nevertheless, they are my preferred payloads whenever the situation allows me to use them, simply because they give by far the highest level of assurance. Very nice, could you possibly also make all the 41 Time-based variations available for download as a text file? Thanks for the compliments. You can find a list containing all 41 time-based payloads in the zipfile that is mentioned in my post for download. The 41 payloads are gathered in the file named ‘ALL’. Awesome post, keep it up buddy! Very useful.Thank you so much. Thank you for this post! It helped me out tremendously! !